The Melbourne Cup is a two-mile (3200-metre) handicap run at Flemington in Melbourne on the first Tuesday of each November. But in Australia it is far more than that. It is “the race that stops a nation’’, and Cup day is the one day of the year in this gambling-mad country when, punter or not, almost everyone takes in interest in the Sport of Kings. The Melbourne Cup is the jewel in the crown of the Melbourne Cup carnival, a four-day festival of racing that is itself the highlight of a glittering spring carnival. The Cup carnival includes arguably the best day’s racing on the Australian calendar, Victoria Derby day, on the Saturday. Cup day follows on the Tuesday, Victoria Oaks day (or Ladies’ day) on the Thursday, and VRC Stakes day (or Family day) on the second Saturday. Derby day features four group 1 races – the Victoria Derby, Empire Rose Stakes, Kennedy Mile and the Coolmore Stud Stakes – containing the cream of the thoroughbred population competing at the best racecourse in Australia. The Cup itself has changed markedly in recent decades to become a prime target for international challengers from Japan, Europe and elsewhere. With prizemoney around the $7.5 million mark, it is one of the richest turf races in the world. No longer is it a battleground for tough-as-teak handicappers from Australia and NZ. The likes of global giants Godolphin and Coolmore have taken to sending their bluebloods Down Under to chase the trophy. While we won’t pretend it will be easy, the potential is there for a big score on the race. A quick look at the exotic dividends from recent years will tell you that; trifectas can pay in the tens of thousands and first fours in the hundreds of thousands. With all the betting pools overflowing with “uneducated money”, most betting options are paying over the odds. Be aware though that your bookie may have a cap on winning exotic bets; you need to be sure your betting operator will pay out the full dividend if you do land that miracle trifecta or first four. Imagine landing a 100k-plus result only to discover in the fine print that the maximum payout is, say, $10,000. Racing has often been called a four-legged lottery and this is truly the case in the great two-miler at Flemington. Unknowns from abroad and unlikely types from Australia and NZ can surprise and run into the placings or even win, giving some lucky punters a dream result. Imported stayers have taken a stranglehold on the Aussies’ great race. But given most of the field now is made up of horses which were either formerly trained overseas or still are, it can be difficult to sort through them. It can pay to look for a lightly raced type which may have beaten the handicapper and is still on an upward spiral. The winner will usually have started in Australia at least once before taking on the Cup challenge. The first Melbourne Cup was run in 1861 and was won by Archer, which legend has it has walked all the way from his stable near Nowra in NSW, some 800km from Flemington. But that has been dismissed as a myth, and it is believed Archer was brought by steamboat from Sydney. How ever Archer travelled, it worked again in 1862 as he again won the Cup in grand style. Archer’s connections received £710 and a gold watch for the first win and £810 and a gold watch for the second, a far cry from the $7.3 million in prizemoney offered in 2018. Even the gold cups that accompany the winning prizemoney now is valued around $250,000. 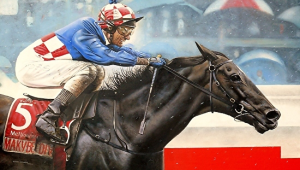 The 1985 Melbourne Cup was the first race in Australia boasting prizemoney of $1 million. It was won by What A Nuisance. The earliest Melbourne cups had been run on Thursdays but in 1875 the race was switched to the first Tuesday in November, where it has remained since. The 1876 Cup was notable for the quality of the winner, Briseis, which won the Cup, VRC Derby and the VRC Oaks in a space of a week. She was ridden in the Cup by Peter St Albans , the youngest winner of the race who was just a few days short of his 13th birthday. In 1972 the race was adjusted to 3200 metres after Australia adopted the metric system. This makes the race slightly short of the traditional two miles and therefore it is difficult to compare times from before and after this change. But the race has continued to flourish and has become a tempting target for leading trainers from around the world. Irish stayer Vintage Crop opened the floodgates for the challengers with his win in the race in 1993, and the modern race has a large percentage of candidates from outside Australia. It is not just horses trained overseas which have emerged as a dominant force. Australian owners and trainers have imported European-bred stayers in large numbers in their quest for victory on the first Tuesday in November. 2002 The Dermot Weld-trained Media Puzzle scored to give the canny Irish trainer his second Cup success, but the victory was memorable for another reason. The gelding was ridden by champion Australian jockey Damien Oliver, who had lost his brother Jason in a barrier trial fall a week before the race. Who could forget Damien Oliver, who also lost his father Ray in a racing fall, saluting the heavens on his return aboard Media Puzzle? Of course, Weld was the first trainer to win the Cup with an overseas-trained horse, with Vintage Crop in 1993. 2003-2005 Three wins in a row for the incomparable mare Makybe Diva. After the third win trainer Lee Freedman famously said: “Go and find the smallest child on the racecourse because he might be the only one to see it happen again …” Freedman was probably wrong, though, because her feats will likely never be matched. 1930 Phar Lap overcomes all obstacles, including being fired upon by gangsters allegedly hired by bookies. Australia’s most famous horse at his dominant best. 1997 Might And Power beats Doriemus by a nose in a deceptive finish after which Greg Hall celebrated wildly on Doriemus. Might And Power had become the people’s favourite with his bold frontrunning style. He just refused to surrender. 1983 A scrubber called Kiwi wins for young NZ jockey Jim Cassidy. Kiwi produced an incredible finish to come from last. Cassidy, of course, became one of the greatest jockeys in Australian racing history. “A New Zealander winning the Melbourne Cup on a horse called Kiwi. Still the greatest thrill of my life,” he said much later. 1890 Carbine carries a mammoth 10st 5lb … still a record, and he beat a field of 40. One of the undisputed champions to claim the race. 2008 The outsider Viewed gives the Cups King Bart Cummings a neat dozen wins in the great race. Viewed held on from Bauer by a nose for rising jockey Blake Shinn. 1932 and 1934 Peter Pan. A superstar of his day which was compared favourably with the Big Red, Phar Lap. Overcame all sorts of obstacles to become a rare multiple winner of the Cup. 1996 Saintly. A wonderful horse. Well, he must have been given one J.B. Cummings rated him as probably the best he had trained until that point. A memorable spring for Bart and Saintly. 1990 Kingston Rule won for Bart Cummings and young jockey Darren Beadman, who would also go on to become a great of the turf. Kingston Rule ran a cracking time of 3 minutes 16.3 seconds which has not been bettered in Cup history. Thousands of trainers in Australia and elsewhere each year dream of glory at Flemington on the first Tuesday in November, yet on the day a maximum of 24 horses will line up in the two-miler. So unless you have sound inside information we can’t recommend investing too heavily in the long-range Cup markets. Yes, the odds can seem lucrative, especially when you include a Cup runner as part of a double. But there is one fact you need to remember regarding all-in betting: If your horse goes amiss or simply is out of form and is not pressing on to chase the race, you do your money cold. Many fancied contenders will fall by the wayside in the months leading up to the race, while others which may be well fancied may be forced to alter preparations just to qualify for the Cup. Choose a horse which is certain to have the race as its main goal, and preferably one which is already qualified. This means the trainer can focus on getting the horse to the race without changing plans along the way. If you are looking at the overseas contenders you need to find a horse which is still on the way up. The highest-rated horses which head to Australia with big reputations are forced to carry big weights. Their record in the past 20 years is poor. Keep a close eye on Godolphin, Coolmore and Dermot Weld. Godolphin had a stated desire to win the race and the royal blue finally won out in 2018 with Cross Counter. They have refined their methods for chasing the trophy over two decades and had come close several times before finally cracking it for the win. Coolmore have similar claims, and have the quality of thoroughbred and the financial clout to suggest they will also win the race at some stage. Dermot Weld is the stereotypical canny Irish trainer. He already has Cups under his belt with Vintage Crop and Media Puzzle and if he sends a horse all that way it must be respected.